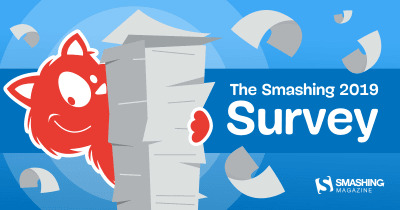 Today, we’re launching a Smashing Survey. We want to find out about you, our readers, so that we can better bring you the tutorials, articles and resources that you need. Our entire aim here at Smashing Magazine — and my focus as Editor-in-Chief — is to provide the most helpful and interesting content and resources for web professionals. We aim not only to introduce new tools, technologies, and best practices, but also to give you handy resources to refer back to and put on interesting live events such as our conferences and webinars. To be able to do that well, we need to understand the people who read Smashing Magazine, come to our conferences, and sign up as members. Given that we don’t ever get to meet or interact with the majority of folks who visit the site, this can make it quite difficult for us to better understand our readers and subscribers. Many of our Smashing Members join us in Slack, and we get to chat with conference attendees. However, these two groups are small in comparison to our worldwide audience. So today, we’ve decided to launch a Smashing Survey which will help us create even more relevant content and shape the future of Smashing. The information will be used only here at Smashing to guide our content and our work, to ensure that we are doing the best we can for those who you who give us your time and attention. The survey contains up to 35 questions and will take you only 5–10 minutes to complete. Join in! We look forward to learning more about your experience with Smashing Magazine, and the things that matter to you. We promise to use that information to provide the resources that you need.